I joke around all the time with my wedding clients telling them "...You’ve got to work hard to get your picture on my web site...". Well here’s a couple that went above and beyond the call of duty. Despite the stellar weather forecast earlier in the week before their wedding, they awoke on the big day to temperatures hanging around the 40 degree mark with a constant drizzle and intermittent steady rain. 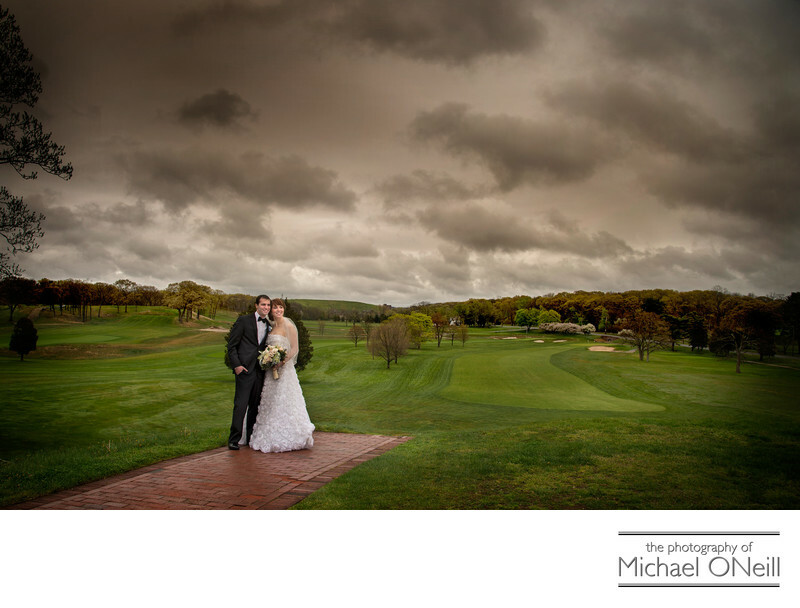 Their wedding celebration was taking place at Carlyle on the Green at Bethpage State Park on Long Island, New York. This shot was taken overlooking the infamous "Black Course" which was home to the US Open golf tournament on two separate occasions. The couple’s plans to hold their wedding ceremony outdoors under the spectacular gazebo at this venue had to be changed but their resolve to have a couple of outdoor photographs made was not to be challenged. The wind was howling during these photographs and the groom had to hold the bride’s veil against her back to keep it from blowing away. Her fashionable wedding gown had to be bustled up to keep it off the wet ground. The smiles on their faces belie their real emotions and they stood shivering in the nasty weather to get this shot. Getting this shot was a real team effort. I have to thank the best man and maid of honor for helping with the bride’s dress and for providing cover under umbrellas. Special thanks go out to Janet from Carlyle on the Green and my assistant, Vivian, for braving the damp weather as well.